New Female Betta - How Old? Discussion in 'Freshwater Beginners' started by rena7874, Apr 16, 2017. I got a new female betta from the 'baby betta' rack at Petco for my 5.5g tank. She's lively, colorful, and curious so far. Given her vibrant coloring and body shape, I don't think she's in the fry stages anymore. How old do you think she is? I'd like to know to provide for any special needs a young fish may have. I fed her frozen brine shrimp this morning, which she ate happily. I think the betta pellets I have are too big for her mouth still and firstbites is too small, so I'll feed brine shrimp once/day for now. She seems very aggressive so far - investigating everything in the tank, including the filter, plants, and Malaysian trumpet snail, with a nip. I hope the aggression fades out a bit because I'd love to keep some amanos in this tank. And BBS. feeding brine shrimp is fine and maybe mysis shrimp would be better if you can get your hands on them. She appears to be 4-5 1/2 months of age. Aggression will fade. It's just curiosity. 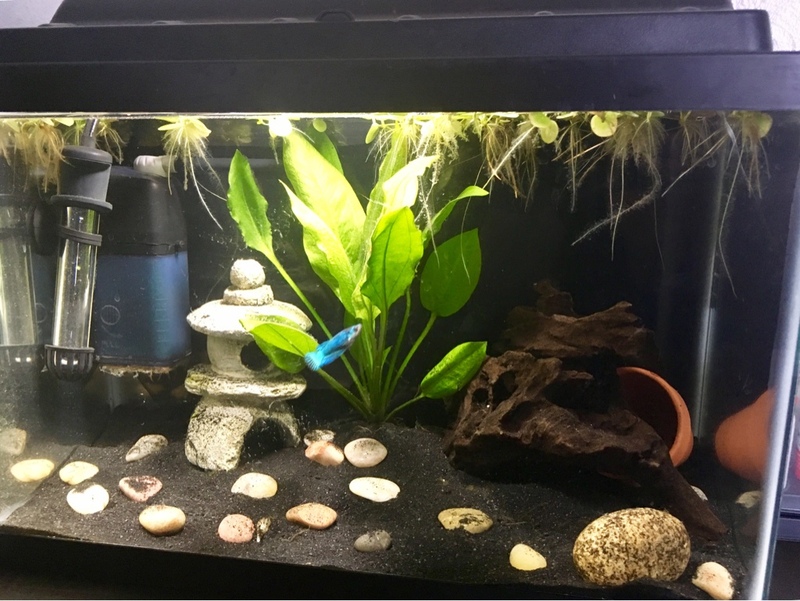 All new Bettas are curious, I'm not surprised as living in a cup must be pretty boring. She is adorable! Such a pretty color. Your tank looks great! What type of floating plants do you have? Thank you! I can't wait to watch her grow out and build the strength to dart around the big tank all day. Mysis shrimp is a good idea, I can't feed blood worms because I'm allergic. Thanks EJ! I like the look of the massive sword plant as the centerpiece for a small tank. Hopefully keeping it trimmed isn't too much of a hassle. The floating plants are amazon frogbit. It grows prolifically wherever I put it, including a jar of tap water in the window that the cat drinks from. Fish and shrimp love to hide in the roots, I definitely recommend.